TechRadar has teamed up with Kingston Technology to give TechRadar readers the chance to win a Kingston SSDNow V+ series 512GB SSD drive worth £1000. The Kingston SSDNow V+ Series is the ultimate upgrade, allowing you to seriously enhance the performance of any computer by replacing your existing hard disc with a super-fast solid state drive. 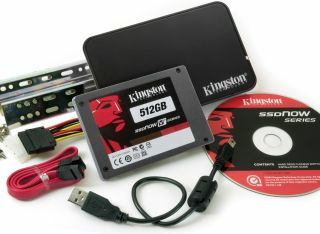 Upgrading is effortless, whether it is a notebook or desktop computer the Kingston SSDNow V+ Series installation kit includes everything you need to enhance the performance of your computer. Faster and more reliable than a standard hard drive, the Kingston SSDNow V+ is available up to 512GB and installing it is easy. It makes your computer faster, tougher, cooler and much quieter. With a Kingston SSDNow drive your data is more accessible, meaning you spend less time waiting for applications or files to load allowing you to work or play much more efficiently. Spinning disks and magnetic heads are replaced by solid-state flash memory, meaning that there are no moving parts. This means no whirring, and warm laptops can run cooler and more reliably, making everyday computing much more enjoyable. SSDNow V+ is backed by a three-year warranty, 24/7 tech support and legendary Kingston reliability. This competition is now closed. The winner is James Patient. Please note that this competition is only open to UK residents over 18 years of age. There is no cash alternative to the prize and unless agreed otherwise in writing the prize is non-refundable and non transferable.